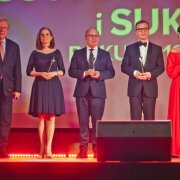 The President of Personal Data Protection Office was awarded the title of "Personality of the Year"
The title and statuette were awarded during the Gala organized by the Magazine ‘Osobowości i Sukcesy’ (‘Personalities and Successes’) on 30 March 2019 in the ‘Pałac i Folwark’ in Łochów (near Warsaw). The awards were awarded for exceptional achievements in the field of creativity, entrepreneurship and social initiatives. This year’s awards were presented among others to Prof. Michał Kleiber, Prof. Mirosław Wielgoś, Prof. Wiesław Tarnowski and Krzysztof Zanussi.